CD 37: Mahler: Symphony No.8 In E Flat - "Symphony Of A Thousand"
CD 38: Mahler: Symphony No.8 In E Flat - "Symphony Of A Thousand"
CD 40: Mahler: Songs from "Des Knaben Wunderhorn"
CD 43: Mussorgsky: Pictures At An Exhibition, etc. CD 51: Tchaikovsky: Ouverture Solenelle Op.49 "1812"; Fantasy Overture "The Tempest"; Marche Slave, Op. 31; Fantasy Overture "Romeo And Juliet"
The Berliner Philharmoniker elect their own conductor: after von Karajan’s death they chose Abbado, and that mattered. He rejuvenated the orchestra, expanded its repertoire, and created a less autocratic atmosphere, inspiring levels of commitment and communication from his musicians that resulted in performances and recordings that stand the test of time. 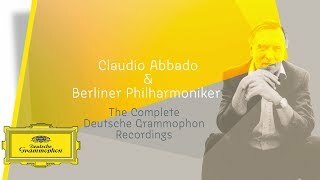 Abbado’s tenure with the Berliner Philharmoniker can be considered as one of the highlights in the orchestra’s history and many of their recording together still remain unsurpassed on record. Deutsche Grammophon celebrates this partnership with a 60-CD limited edition collection of their complete recordings – many classics right from the start.